The hukou system is a governmental household registration system. In Taiwan, this system operates mostly as census tool, providing demographic information about residents in each region. In China however, the hukou system is used to actively limit where a person is allowed to live, especially if one is born into a rural hukou – attempting to change to a more attractive residence or to an urban hukou can be extremely difficult, if not impossible. In this way the hukou system institutionalizes inequality and consolidates the government’s administrative control over China’s population. To understand these impacts, the evolution, and future of the Chinese hukou system and its relations with the broader reform agenda rolled out by Chinese President Xi Jinping in 2013, Taiwan Security Research conducted an interview with Professor Fei-Ling Wang, the author of Organizing Through Division and Exclusion: China’s Hukou System (Stanford University Press, 2005), a critical investigation of this extremely important but seldom explicated system. Priyanka Juneja: In 2013, with the third plenum, President Xi promised “unprecedented reforms” meant to ensure China’s economic vitality. How do you assess the progress of these reforms in China today? Fei-Ling Wang: Based on the wording alone, the newly proposed reform is pretty extensive and also quite in depth. However, so far, the implementation is yet to be seen. Instead, there have been observable counter trends of the reform proposal. For example, a major theme of this reform had been to let the market decide the allocation of resources, which I think is the right move. But so far, not only have we not seen much of that, but also I’ve witnessed a number of counter trends. The state seems to be pretty tenacious in staying in the economy. So two quick comments, one, it is probably too early to assess it [the progress of reform] and two, so far, implementation has not been very extensive. Priyanka Juneja: What are the relations between hukou reform and the rest of the 2013 reform agenda? Fei-Ling Wang: The promised hukou reform was a major part of the new reform proposal. They [China’s government] want to speed up urbanization, and allow more people from the countryside to live in the cities. They are hoping to use increased urbanization as an engine to drive more growth – people move to cities they buy a house, buy cars, buy services, goods, and so on, so forth. “New engine for the slowing economy,” that’s the idea. It is promising, but so far, again just like the overall reform package, the reform has been one, limited, and two, very localized as expected – different regions need/want a different kind of implementation. Three, the effect on economic growth has been not very impressive. This is because the places that people want to go to are these big cities, these prosperous urban centers, which are actually sealed off. And the government wants people to move to small cities/towns, but these towns do not have many jobs to offer, and that’s not very attractive. Four, by this kind of fast administrative urbanization, many peasants worry they are going to lose their land and end up with no job in small towns. That’s kind of a bad choice for them, so the effect of that new proposal has not been very big, precisely because the other policies [for sustainable transition] are not in place. Also, the reform is very localized – only in small towns, not Beijing, Shanghai, or Shenzhen – those cities are very attractive to the country folks but they are not relaxing their immigration control. Priyanka Juneja: So, hukou reform implementation is decided at the local level? Fei Ling Wang: That’s right. Reform policy implementation is determined by localities. Localities have got to decide who they can admit, and who they don’t want to admit. They have a kind of varied standard and big cities are explicitly of the “not include” type – like Beijing is of the “not included” [type]. Priyanka Juneja: In a piece you wrote in 2004, “Reformed Migration Control and New Targeted People: China’s hukou system in the 2000s,” you said that despite reform and public outcry “This omnipresent and powerful, albeit adapted and adjusted, system is alive and well.” Does this diagnosis still hold true? Or does current reform now signal a weakening of the system? Fei-Ling Wang: I have to say, with some kind of pride, that prediction still holds true, so far. The hukou system, for the past 10 years, had made some adaptations. Some are what I call “cosmetic changes,” and some are substantial changes. But the basic system, that is to segregate people and manage them, is still there. Administratively, this kind of organizing through exclusion is still there. The difference is that now it is more localized – different regions, different policies. Moving to Beijing, versus moving to any small city, is very different. So, instead of just one great divide between rural and urban hukou, now you have many city walls, like local hukou versus outside hukou. You may have hukou in one city, but not have it in another city – many city walls are being erected. That’s called localization. But overall, the system is still there. It’s not going to be abolished any time soon. Priyanka Juneja: Some kind of hukou reform appears to be imminent, but what difficulties might the government face in implementing reform? Fei-Ling Wang: Resistance to any proposed major reform now, ironically, comes from the urban people – not ironically, but expectedly I guess – and not necessarily from government planners. Government planners are hoping to speed up urbanization even in large cities so the economy can get a new driving force. However, urban officials, the local cadres, see this as compromising their current privilege. They see the rural folks as coming in to share their fruits. The urban-rural difference in China is horrendous – living standard, income, education, medical service, you name it. This great gap really makes the urban folks feel they are privileged and wonder why they should share the scarce resources with country folk. The local officials also worry about it [hukou reform], as it may get local people really angry or create a management issue. So, they are kind of resistant to it [hukou reform] as well. If you are into high-speed economic growth in these glittering cities, you would also be kind of reluctant to let millions come in, presumably to share your resources, and to take away your goodies. Priyanka Juneja: Can cities fund the increased social welfare costs associated with loosening or removing hukou regulations, and do you think they will do so? Fei-Ling Wang: Well, if the Chinese property rights regime is rectified, or reformed, I believe that Chinese urbanization should be greater. In other words, more people should and could live well in the cities, even big cities. But right now the property rights are skewed, and resources are lopsided, and the government basically dictates resource allocation according to policy preferences. So, that goes against market allocation. Therefore, the big cities, on the surface, appear to be unable to accommodate outsiders. To be fair, those big cities are not real to begin with. They are the result of policy decisions not market forces – not because they are efficient, necessary, or natural big cities. Many are artificial like Beijing – Beijing, by natural endowment, should not be such a big city. But not only did it become a megacity, it is also a very attractive mega-city – because all of these policies dictated resource allocation to Beijing, making it very attractive. If that system is reformed, then Beijing will naturally lose its attraction, which may be good for the city. Beijing shouldn’t be a megacity. The urbanization question will probably be resolved by itself and Beijing can handle more, or another new city can be created to handle more people, or some natural city will be created. To sum up, right now in China, big cities, often times, are policy decisions. They become big cities because government wants them. That goes against natural resources, market logic, and makes them artificial. So, if this artificial city making stays, then yes, the cities will be having a hard time accommodating those people. Priyanka Juneja: How will hukou reform interact with the new population limits set on cities? Combined with the effects of the two-child policy? Fei-Ling Wang: The two-child policy is also designed the same way, as one, to create new growth and two, to pacify some residual resentment. I think that’s a good thought. But, the impact is yet to be seen; it takes forever to produce more kids, and then the inertia of the one-child policy still continues because economically it’s expensive to raise kids in the cities. But that [two-child policy] actually complicates hukou reform, because it all depends on the urban population or the rural population producing more second-children. The situation is complicated because you have more kids to deal with in the cities, and schools may be even more crowded. We have to wait for that kind of data, because this policy just started a year ago, so we don’t know the impact yet. Chinese government is actually launching a campaign to encourage people to have a second kid, because they think that having a second kid will be good for the economy, which remains to be seen. Priyanka Juneja: In your previous writings, you seem pessimistic about hukou reform because of its political utility for CCP control of “Zhongdian Renkou” [“target population”]. Do you think in the status quo there might be some alternative utility to reform for CCP? Fei-Ling Wang: It’s going to be hard, because the hukou system has been a very useful social control tool, not just for the CCP but during imperial times as well. They can cut off the economic role of the system even further, by separating [the] hukou system from resource allocation. For example, they can allow people to move into big cities if they can find a job, and just update the controlling mechanism, to make sure they stay in control. But in practice it’s hard because they don’t want to bring too many people into a place they consider sensitive or hard to manage. This is why they cannot open the door yet. The political utility is the final reason why the hukou system is here to stay for a while. It may be called a different name, it may undergo some kind of transformation – further cosmetic changes – but the essence of registering people, controlling them administratively and segregating them and excluding them, I think is here to stay. The financial and economic utility of the system may change, in some cases, become less significant over time. But in other places, it will become more significant, like big cities. So that may change, but the fundamental political rational of the system will stay. There is tremendous political utility here. You may not agree with the Chinese political leaders’ rationale to control people, one-party dictatorship, and so on. You may not agree with that, but if you agree with that, you will say this is a very powerful tool. For that kind of political system, the hukou system has been very useful. That’s where people like me are kind of pessimistic about the future of reform/abolishment. To make the Chinese hukou system purely population management like a demographic information system is very unlikely, without political change. Priyanka Juneja: What does this reform mean for rural-urban disparities? Won’t it exacerbate geographical/spatial inequality? Fei-Ling Wang: The rural-urban disparities, according to China’s latest data from this year, is larger than ever. All these efforts launched by the Chinese government, which I think has good intentions, to narrow that gap, so far has not been very effective, because they are not working on the fundamentals. The fundamentals we are talking about are land rights, property rights, free immigration and so on. Those things are not granted, so it’s not going to address the issue fundamentally. I think the rural urban divide is [the] world’s worst. Can it be better [rural-urban disparities]? Of course it can. Hukou reform is one way to do that, but these land rights, property rights, need to come first. The peasants have to become owners of their land, to be well equipped and endowed to compete. Right now, they are working on land they don’t own and cannot sell. Land is appropriated or cheaply bought by the government and sold at a high price to developers and peasants don’t get much of that. And peasants can’t move because of the hukou system; therefore they cannot have a real, free job market. They are like illegal immigrants working in cities. It’s like the United States – illegal immigrants don’t get full pay, they don’t get all the benefits. With further reform of the hukou system, and rural workers get full citizenship and can move their families to cities, the interior rural area may end up in a situation like many American rural areas. Many young people will go to cities, and the towns will become ghost towns with very few farmers left to work on big fields. That looks sad in some ways, but I think that’s progress. We don’t need so many people in the fields. We want land to be worked by fewer people. That requires property rights reform, land rights reform. Right now, it’s not there. Right now, the reform of hukou has created an issue of abandoned land, because there is no ownership. That’s rural decay. But, if they can move their family to cities, then that’s progress. Right now, many are temporary, some are illegal, and families are left behind. Families left behind is a tremendous problem. If they can bring their families, the rural areas will be universally hollowed and villages will die, but that’s progress. Priyanka Juneja: If peasants are able to move to cities with their families, won’t this cause greater overcrowding in the cities? Fei-Ling Wang: Chinese cities are already overcrowded. The problem here is not that they have to be crowded or that the crowdedness is a problem. Many cities in East Asia are just as crowded. For example, in Japan, density is higher than in China. Cities can be crowded but well managed, worth living in. Secondly, cities in China don’t have to be crowded – if you allow cities to grow naturally, not by policy preferences. Government just showers money onto some cities, so of course those cities will seem very attractive, so people go there, and it becomes very crowded. If you let cities grow by themselves, in a market fashion, where there is water, land, resources, a reason to grow cities, cities will grow. That’s a different kind of story. Chinese cities don’t have to be crowded. If they are crowded, price goes up, and people will leave. That’s called market mechanism. But in this case, resources are dictated by policies, therefore if they say Beijing has to be prosperous, so they put a lot of money into Beijing, making it very prosperous and attractive. But yet, Beijing cannot, hold so many people. That kind of crowdedness is bad, because it’s artificial. Priyanka Juneja: How should hukou reform be implemented? “Orderly Reform”? Abolition of the system? Something else? Fei-Ling Wang: They have been talking about “Orderly Reform” for more than two decades. This is a kind of big issue, and if you talk about it, you can score points. Chinese media has been saying it’s gone for 20 years. 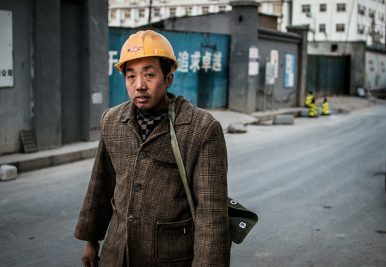 If you ask privileged urban dwellers, like those with Beijing hukou, they will tell you that hukou doesn’t matter, because they don’t feel the pain. That’s the thing. Unless China’s political system is reformed, almost fundamentally, it’s going to be difficult. Unless you have free press, an independent judiciary system, give people the right to vote/speak, and redefine property rights – the hukou system is hard to reform in any dramatic way. In other words, Chinese people are not full citizens. So, how can you make them full citizens – abolish [the] hukou system. They need equal rights. If you are in Beijing or you are in rural villages, you are all Chinese but you are not equal – don’t have equal citizenship, cannot resettle freely. Priyanka Juneja: Can you tell us a little but about the Taiwanese version of the hukou system? Fei-Ling Wang: The Taiwanese hukou system transformed a long time ago. They are now even more liberal and less significant. It’s basically like data management. It used to have economic meaning to farmers. But starting in the 70s, 80s, they have done away with that, and now [Taiwan has gone] even further. If you move between cities, hukou is not an issue. It’s like the United States, you automatically get local hukou, or in the U.S. you automatically get local voting rights. Priyanka Juneja: Is there something in particular that drew you into the study of the hukou system? Fei-Ling Wang: Every conscious Chinese knows this system. I was lucky, I was born into an urban hukou family, but I’ve been to the countryside. I was sent to the countryside at the end of the Cultural Revolution, after Mao’s death. I experienced how the hukou can mean so much to your life. And then you study the Chinese political economy, you see how important the system is. Many Chinese choose not to talk about it, because it’s like a devil everybody knows. It’s sort of unpleasant to talk about it especially if you are privileged. If you happen to be unprivileged, like the majority of Chinese, you feel the pain but you have no voice. And also, if you are not trained, you don’t have the knowledge or the time to see the whole picture. You are kind of busy making your daily living, you don’t see the whole picture. It’s important, and it’s one of the few important things in the Chinese system that is underexplored, because it is hard to explore. Priyanka Juneja: Are there any projects you recently completed or are currently working on that our readers might be interested in? Fei-Ling Wang: I have a book coming out, called The China Order: Centralia, World Empire, and the Nature of Chinese Power (SUNY Press, 2017). It addresses the nature of rising Chinese power. If you are interested, please check it out! Fei-Ling Wang, Ph.D. (University of Pennsylvania), is a professor at Sam Nunn School of International Affairs, Georgia Institute of Technology. Dr. Wang has published seven books (two co-edited) in two languages including Organization through Division and Exclusion: China’s Hukou System (Stanford University Press. 2005) and The China Order: Centralia, World Empire, and the Nature of Chinese Power (SUNY Press, 2017). He has also published dozens book chapters, journal articles, and reports in four languages. Before coming to Georgia Tech, Dr. Wang taught at the U.S. Military Academy (West Point). He has held visiting and adjunct/honorary positions in institutions like the European University Institute, Sciences Po, the National University of Singapore, the National Taiwan University, the Renmin University of China and Anhui Normal University in China, the University of Tokyo in Japan, the U.S. Air Force Academy, and Yonsei University in Korea. Wang has appeared in many national and international news media such as Al Jazeera, BBC, CNN, Radio China International, The Financial Times, The New York Times, The Wall Street Journal, and the Xinhua News Agency. He has had numerous research grants including a Minerva Chair grant, a Fulbright Senior Scholar grant and a Hitachi Fellowship. He is a member of the Council on Foreign Relations. Priyanka Juneja is student assistant with Taiwan Security Research, a non-partisan, academic, and non-governmental website designed to aggregate and disseminate information on current events relating to Taiwan’s security and regional security issues. She is also a research assistant at the Sam Nunn School of International Affairs, Georgia Institute of Technology.